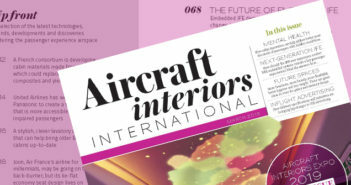 You are at:Home»Features»Airlander 10: a dream becoming a reality? 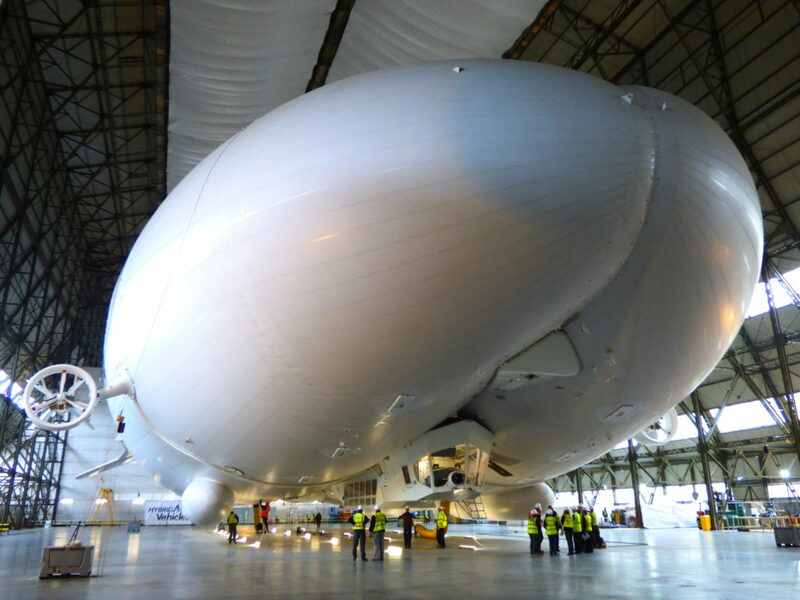 Airlander 10: a dream becoming a reality? Welcome to the world’s largest aircraft, which, if its development goes to plan, will offer possibly the most luxurious and intimate passenger experience in the skies, and could even influence future commercial aircraft interiors. The Airlander 10 is a hybrid airship designed and built by British manufacturer Hybrid Air Vehicles (HAV), originally as a US Army program, which was canceled in 2013 but revived by HAV as a civilian aircraft project in 2016. The aircraft is truly vast, at 92m (302ft) long (20m longer than an A380) with a 38,000m3 (1,300,000ft3) envelope. One application the airship was originally developed for was ‘eye in the sky’ duties, monitoring conflict zones from a static position in the sky. The Airlander’s military credentials may have been revoked, but that ability to stay aloft for long periods of time and to travel very slowly with little noise makes it perfect for sightseeing excursions in a mobile environment akin to a boutique hotel with incredible views. 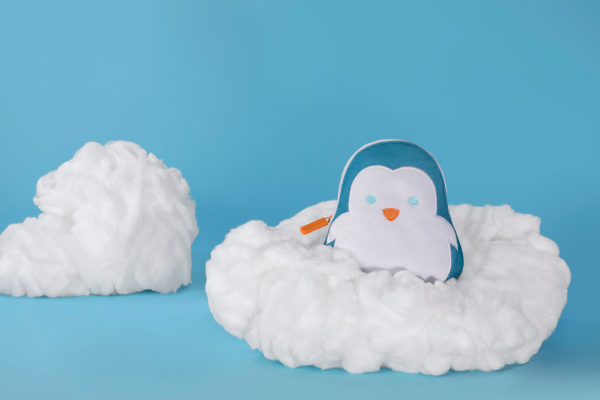 Just imagine gliding over the North Pole or the Serengeti in silence, observing the glory of nature from the comfort of plush, temperature-controlled and predator-free accommodations. Airlander 10 can also take off and land from almost any flat surface, whether desert, ice or even water, eliminating the need to begin the trip from a traditional infrastructure location such as a port or airport and opening up opportunities to land and set foot directly in remote places without getting one’s Guccis muddy through any bothersome hiking. The difference is Airlander focuses on time rather than distance, with air cruises of 50-100 miles around areas of beauty spanning up to five days being a predicted market. While it is dwarfed by the inflatable structure, the passenger cabin is pretty spacious, at 20 x 3.2 x 2m (65 x 10.5 x 6.5ft) – especially when you consider it is only intended to carry 18 passengers. 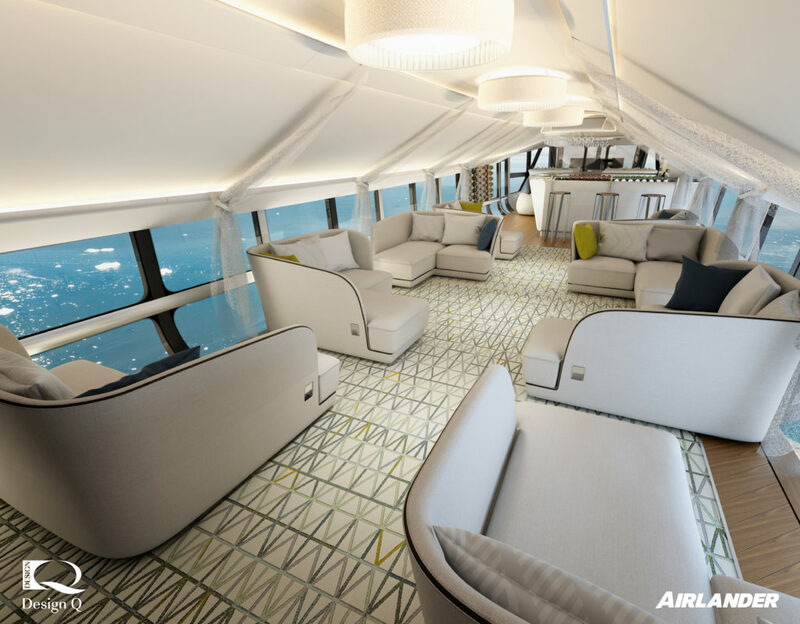 The space is an attractive proposition for a cabin designer, featuring huge floor to ceiling windows throughout, an optional viewing deck, and design possibilities that are far less constrained than commercial jet cabins. “It does open opportunities of what you can do with the space and allows you to look at first class transportation in a completely new way,” says Guy. 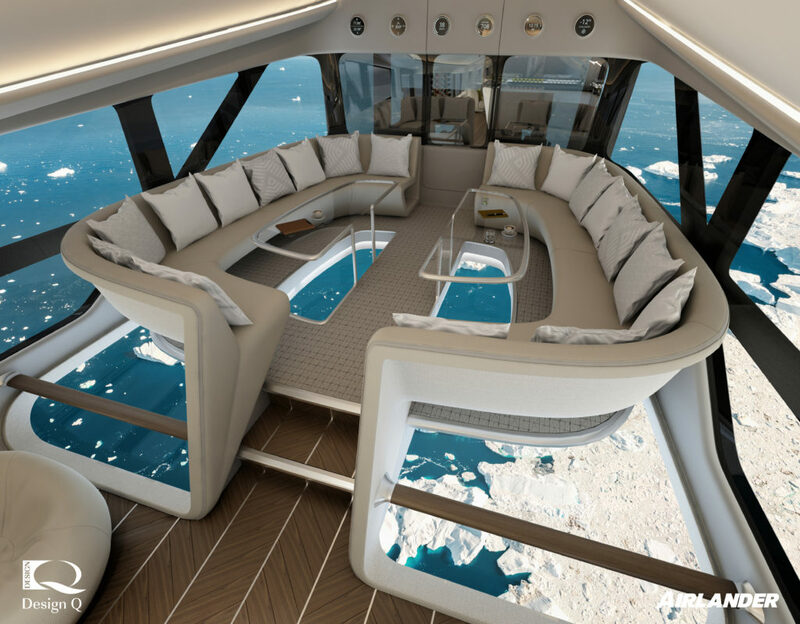 So what would the airlander cabin offer? Design Q has been striving to achieve the feel of a luxury apartment, with flexible zones that can create various activity zones, customized to the journey and passenger profiles. This is rather different to commercial first class, where the focus is often on an enclosed suite. “This is all about moving around, talking, meeting, eating, doing whatever you want to do, like you would at home,” Guy adds. The relative ease of the regulations compared with the studio’s commercial aircraft work of the cabin configurations can be changed the day before a flight or even inflight. For example, if there are only 15 guests, the modular structures can be configured to remove a suite and expand the lounge with another window and sofa. The sky doesn’t really impose a limit, with the modular design enabling zones such as a bar, lounge, disco, luxurious bedroom suites – whatever operators or even private clients may wish. Better still, the zones are flexible. 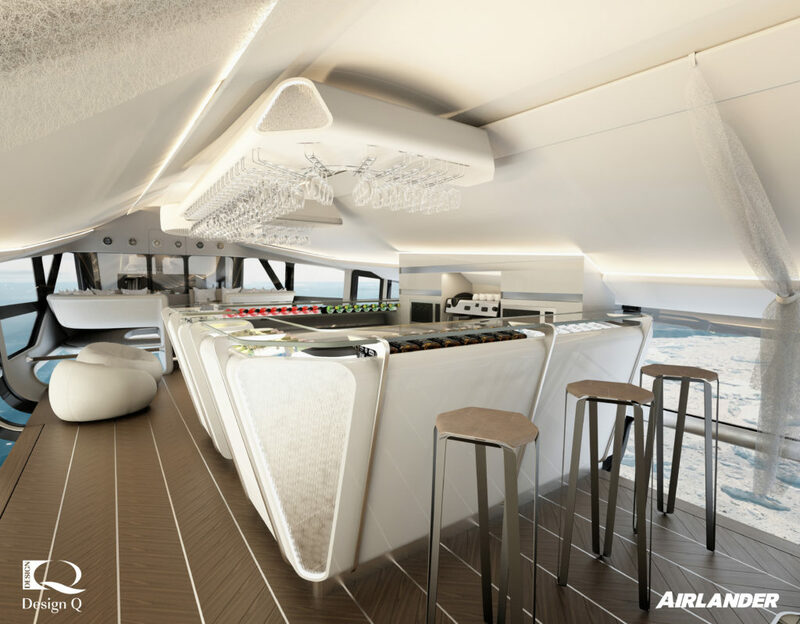 For example, a cocktail lounge could be reconfigured as a breakfast room, voyage briefing room, fitness room or afternoon tea lounge throughout the day. Guy describes the modular scheme as a “joy” to work with as it “allows you to think differently”. This all sounds marvellous, but is it a realistic proposition for certification or a giant pipe dream? Guy has read up on the relevant regulations, and has found that, “some regulations haven’t been written yet, which is quite cool. This is not like a rigid aircraft, which has to be laid out a certain way”. Indeed the studio is now working to finalize the production design with the Airlander engineering team and anticipates sharing ‘exciting news’ in the next few months. The relative ease of the regulations, especially compared with the studio’s airplane cabin work, also makes those flexible cabin configurations entirely possible, according to Guy. The FST regulations are expected to be the same as those the studio complies with for commercial aircraft cabins, but the impact requirements are rather different, being 3g rather than 16g. The brief for the seating was that it must not look like aircraft seating; it must look like super-comfortable high-end furniture. Even better, guests can use any seat for TTL under the regulations. “You can do whatever you want, and because it only has to meet 3g , it enables us to do it easily from an engineering point of view – although the seats will be certified 4g ,” says Guy. The Airlander experience will certainly not be inexpensive, but Guy predicts the experience will trickle down into commercial aviation, albeit in the premium cabins. 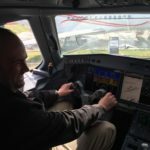 “These ideas will dribble into commercial aviation without question,” he says. “We are already working out how to make these seats 16g because this is what first class passengers really want. They don’t want to be put in a sardine can and charged £6,000 (US$7,600) for it – they want this. So who will take to the skies in Airlander? 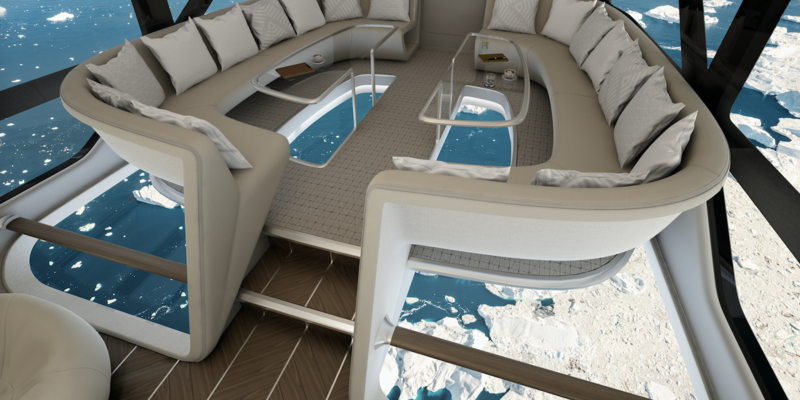 “Discerning private individuals who have enjoyed their jets and private yachts for many years, but are looking for something new and different, something that will give them and their guests unique access to remote parts of the world, to enjoy ‘slow travel’ that enables truly amazing views of our planet,” predicts Howard Guy. Any crazy ideas in the pipeline? The cabins are gorgeous, but come on, this is a giant blimp with regulations that can allow an aircraft cabin designer to let loose with their imagination. So what ideas is Howard Guy secretly plotting? “I’ve been contemplating a glass-bottomed jacuzzi,” he says. Now you’re talking, but is it possible? “There’s nothing difficult about a glass-bottomed tub – you see them in some hotels and modern buildings,” he says. Another of his ideas is to attach giant inflatable zorbing balls to the tail on bungee cords. Guests could climb inside and be launched into freefall before being winched back in. That may well lead guests in search of a relaxing tea in the lounge afterwards, or something stronger in the bar. Guy’s next idea is a little less adrenaline-fueled: having high-powered binoculars on tripods at every window so guests can see every detail of the amazing surroundings. How would one describe the passenger experience? Materials and finishes are seen a key to the experience. “Luxury is about nurturing the senses, providing delight by thoughtful touches down to the tiniest detail. Designed to be relaxing, the real wood flooring and the Tai Ping silk carpets lift the interior to a class of its own,” he adds.